Fresh salmon baked with a delicious Japanese miso glaze and topped with pickled carrots and daikon. Served with a side of roasted bok choy. Oven ready for ease and weeknight convenience. Preheat oven to 425 degrees. Place the salmon and bok choy in separate oven safe pans. Spoon miso glaze and spread across the top of the salmon. Shake and pour dressing over the bok choy mixing well. 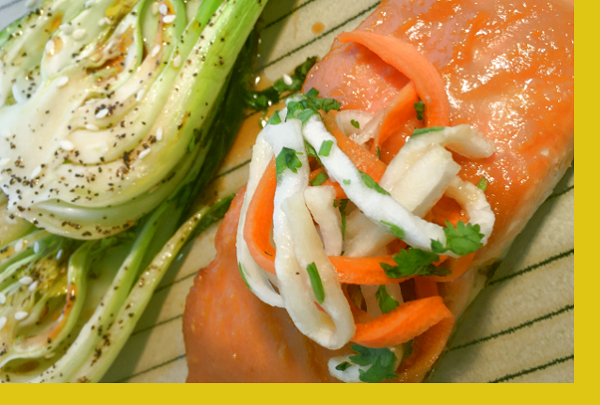 Place the salmon and bok choy in the oven and bake for 20 minutes or until cooked to desired doneness. Bok choy is done when the edges are slightly charred. 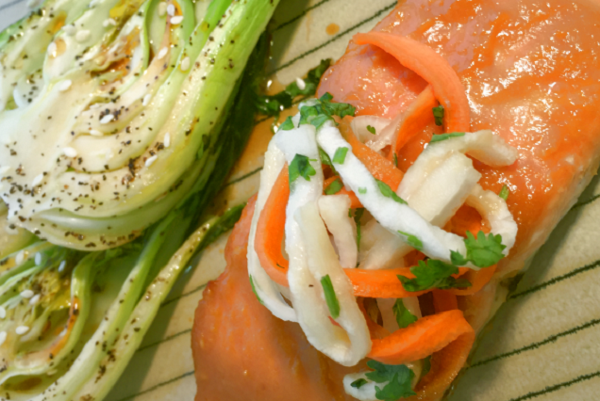 Top salmon with pickled carrots and daikon. Serve with side of roasted bok choy.